There are cotton dress shirts and then there are the fine and stylish dress shirts made by Steven Land. Steven Land dress shirts feature not only fine quality construction by style as well. 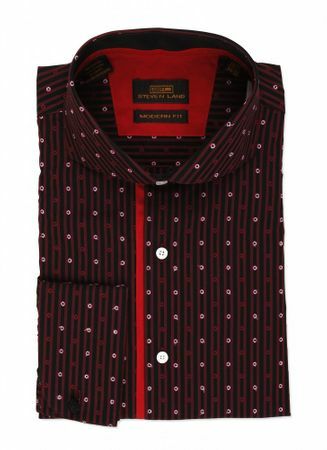 This black with red stripe pattern Steven Land Dress Shirt features dot pattern inlay and is made of 80's Two Ply Cotton Fabric. Don't forget to get yourself a Steven Land Big Knot Ties. It's style you can't ignore. Try a pair of luxurious Steven Land Shoes here.